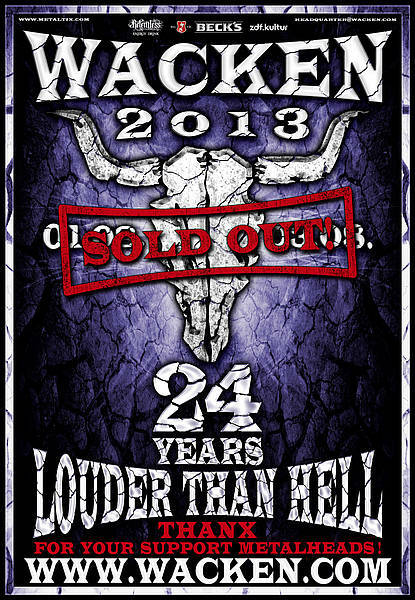 Wacken Open Air 2013 is sold out, and I will be in attendance for the 3rd year in a row. Sadly, I will be attending this festival alone, but no matter. They’ve announced a portion of the bands for the 2013 festival already and I will have a look at them now. Some of them were announced at the end of the 2012 festival, and some were announced in the last fortnight (ish). I will look at these in alphabetical order and just give a brief summary of what I think of them, and their announcement for Wacken 2013. AMORPHIS – Before their announcement, Amorphis is a band I was not too familiar with. Following their announcement, I know a little more of their stuff. I am intrigued about how many different sub-genres of metal they cover (listening to a death metal song right now, but earlier I was listening to one of their more folk-metal songs). I’ve enjoyed what I’ve heard and hope to catch them. As I understand it, they will be doing a full band set and also a special acoustic show. I don’t know if both will be do-able but I certainly hope so. ANTHRAX – Anthrax are a solid booking for any rock/metal festival. I’ve seen them twice at festivals and really enjoyed them both times. They were booked for Download 2012 and I missed them in favour of Edguy. I suspect that if they clash with someone else I want to see, the end result will likely be the same – however this is because I am seeing Anthrax support Motorhead in November. Still, if there is no clash, I will see them and I will really enjoy it. ASP – I’ve seen ASP be described as “gothic novel metal” and “German gothic rock”. Personally, I think they give off a folk-metal vibe. Whatever genre they fall under, they seem pretty good to me and I am not against their booking for Wacken. I will try to catch them, assuming there is no clash. BOB WAYNE – I’m not sure how I feel about this booking. I didn’t have a problem with The Boss Hoss playing the 2012 festival (even though due to weather issues, I didn’t end up seeing them). But I think that was because they do covers of famous rock songs (as well as some other stuff). Bob Wayne is a straight up country act from what I can tell, and I’m not sure how much of a place country has at a metal festival. I’m not overly interested in country music (I’ll make the odd exception here and there) so as a result. I don’t think I’ll be seeing Bob Wayne. CANDLEMASS – I’m not massively into doom metal, but Candlemass interest me to the extent they are one of the early “must see” bands of this announcement. I haven’t heard much by them but what I have heard, I’ve liked. I think this is a solid booking for Wacken and I look forward to seeing them. DEEP PURPLE – One of the early announcements that almost sold me a ticket there and then. I have liked Deep Purple for quite a while now but never had the chance to see them live. I’ve heard questionable reports about them live but I am still excited to see them, and hear some classic songs which I absolutely love. I suspect they will be in a similar spot to Scorpions from this year – longer set on the final night. Might be wrong, but it seems like a logical spot for them. DIE KASSIERER – Don’t really know what to make of this band to be honest. They appear to be a comedy band but a lot of it is lost on me as it is in German. I should really learn that language if I’m going to keep going back there for a festival. Anyway...probably won’t watch this band honestly. I expect a Wednesday slot for these (or perhaps one of the first bands on the Thursday, after Skyline). DORO – This will likely be in the “U.D.O” slot of this year’s festival considering it is also an anniversary show – 30th anniversary to be exact. I am looking forward to this as I haven’t seen Doro (aside from a couple of guest slots with Skyline and U.D.O. I also quite like Doro’s new song, “Raise Your Fist in the Air”, so hopefully there is a new album to come along with the single and it is as strong as the lead single. ESKIMO CALLBOY – Having listened now twice, I can confidently state that they are not for me. I will be somewhere else when they are on. HAGGARD – Another band that could be placed in a number of metals sub-genres but I’d best place it in symphonic death metal. I don’t mind what I’ve heard so far and will likely catch them at the festival. HATE SQUAD – Nothing wrong with a bit of thrash metal here and there. Quite like what I’ve heard from this band. I imagine they will be in the W.E.T tent, which could mean they are missed, but we’ll see. At this stage, it is impossible to know. IHSAHN – I’m really interested in Ihsahn’s solo material. I didn’t know what to expect when I started listening to it, but I really like everything I’ve heard. It explores more sub-genres of metal than Emperor did (I’m not criticising Emperor) and overall, is really good. Ihsahn in some setlists plays a couple Emperor tracks, giving a nod to his previous band, but the main focus is the solo material, and I am looking forward to seeing him live. LINGUA MORTIS ORCHESTRA FEAT RAGE – I like some of the Rage material that I have heard, but I don’t really know what to expect with this set. Is it going to be a set of Rage songs, or songs by a related orchestra featuring Rage? I really don’t know. Only way to find out is by seeing them I guess! NIGHTWISH – Nightwish was another one of the initial announcements which almost sold me a ticket right away. I remember being a little disappointed with their set at Brixton at the end of the Dark Passion Play world tour, but their set at Download bought me round that they are a good live band, and I do remember how immense they were at Wacken 2008. There will be one major change at the Wacken 2013 show to any of those shows though (and indeed, any time I’ve seen Nightwish). Annette Olzon has quit the band. It’s not been made public why this has happened, but apparently it was related to Annette missing some shows and Nightwish bringing in replacement singers, rather than cancelling. I don’t know if that is the reason, or even part of the reason – but it doesn’t really matter. What matters is who will be singing by the time next August rolls around. Floor Jansen has replaced Olzon on the current dates, and she might still be singing for Nightwish then – depends on her touring cycle with Revamp I guess. Personally, think Tarja Turunen should do it.....very very unlikely though! RAMMSTEIN – The band that sold me the ticket. I said that there are 3 things I could think of that would get me back at Wacken next year – Metallica, Iron Maiden or Rammstein. I have seen Rammstein four times now, so they really aren’t a massive draw for a UK festival anymore (don’t get me wrong, I am delighted they are headlining Download). But seeing Rammstein in Germany will be something special I imagine. I am hoping they are still on the Made In Germany tour by then as that setlist was pretty damn good. SABATON – I don’t know much about Sabaton, other than that they are a Swedish power metal band who sing about war, and that the roar when they got announced at Wacken 2012 for the 2013 festival was deafening. I will definitely see this band as I like what I have heard. SCOTT IAN (Spoken Word) – Anthrax’s Scott Ian making a solo appearance at the festival, this time doing spoken word. I caught some spoken word at Wacken 2012 and really enjoyed it. I will try to do this same with this set. I am hoping, due to 3 events that are happening in London this winter that Chris Jericho is also going to do a spoken word set at Wacken, which also means we get Fozzy. That would be alright with me. SOILWORK – I am very happy with this announcement. I saw Soilwork at Wacken 2008 and they blew me away. I am hoping for another performance like that. SONATA ARCTICA – One of the, if not the best bands I saw at Wacken 2008. They were superb then and I am sure they will be superb again. Haven’t really kept up with them since the 2008 set, but I have high hopes they will be immense again. SUBWAY TO SALLY – Missed them in 2011 (I’m not massively fussed about them, and they played at 2am. Not a good combination). If they played earlier in the day, I’d probably watch. We’ll see. So all in all, I would say I am quite positive about the line up as it stands. I am not expecting any more announcements until December when Wacken does the Wacken Xmas Advent Calendar. If there are any more before that, then they would be gratefully welcomed (unless its Corvus Corax, then they can do one!) Anyway – the following is a short list of bands I would like to see get announced to really beef up the Wacken 2013 line up. I suspect I might be a little bit hopeful with some of those. Still, nothing wrong with creating a wish list!